B U B B L E G A R M: Mac Concealer Rave! Isn't it refreshing when you find something you love? I have been using this since mid December, I purchased this purely to cover up scars on my face.This concealer is amazing, by far the best I have ever tried. It gives a matte finish, amazing full coverage and is long lasting. It comes in a black flip lid pot, similar to an eyeshadow. It's quite thick in consistency but not 'cakey', but I imagine it would be if applied around the eyes. This concealer is best suited to the face in my opinion. Below you can see the before and after photos that I took, I applied the studio finish concealer with my fingers, I just dabbed it in the pot and onto my face. I have not applied foundation, powder or blended it with a clean brush. It's just the concealer doing its work. The good thing is it still looks like this at the end of the day! The trick is to find your correct shade. I have also been using this concealer since mid December. This was purchased for the eye area. The MA recommended I go for one shade lighter than my skin tone, but get 'W' instead of 'C'. (W is for warm undertones and C is for cool undertones.) She said, I would need the 'W' to counteract the blueness under my eyes. She was right. 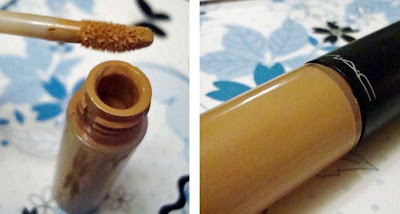 It comes with a doe foot applicator and looks quite like a lipgloss in its tube. The consistency of this is very light, yet it still offers amazing coverage. This concealer did not settle into any fine lines or look cakey at all. Here are my eyes bare. I apply the doe foot applicator directly under my eyes in no particular way, I just swipe it on. I then blend it in with a fluffy blending brush or dab it in with my ring finger and hooray I have 'natural' under eyes with no darkness! I'm SO happy I found these two concealers, they are definitely 'HG' material. I am NEVER going to experiment with anything else. I would highly recommend them! Both concealers are priced at £12. First of all, wow at your eyeslashes! They are gorgeous! 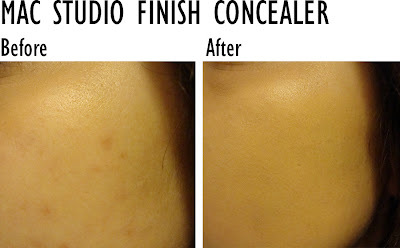 I absolutely love studio finish concealer, its such good coverage! i discovered your blog a little while ago and i love it! i have got the mac select cover up concealer and i find it a bit cakey but the studio finish concealer looks like a keeper, i'm going to purchase that as i've had breakups lately! thanks for this review! @Stroma Thanks :) I have the select cover up too, but I have it in the wrong shade so I havent used it properly. The second one looks fab for what I'm needing so thats a great recommendation thank you. I love my studio finish concealer. But I find it very cakey on any dry parts of my face no matter how much I moisturise! been using mositure cover for years and love it! I have them BOTH in lighter shades lol but I agree they are great !!!! my fav is the Mac studio finish it's thick and the coverage is Amazing ! Wow!! I'm so impressed with the photos! Thanks so much, these are totally going into my makeup collection soon! Studio Finish was the first concealer I ever bought many moons ago. It's really good, I'm going to go back to it, I don't know why I didn't repurchase it. I wanted to buy Moisture Cover a few days ago and typically forgot when I was in the MAC store! Duh! Wow, the Mac studio finish concealer is definitely something out of this world, I doubt there is something that works this wonder out there. Perfect choice!!! I had the studio finish awhile back but was never wowed. I think I'll have to give it another try now! I've been looking for a new concealer, think I'll try studio Finish, thanks! I love the MAC Select Cover-Up that comes in the little tube...it is thinner but still covers my unereye circles and acne scars!! I just apply it before my foundation and maybe a touch-up after (if needed)Yippee. The concealer in the pot and the wand are too cakey for me. Give the Select Cover-Up a go...you might like it, too! I LOVE this concealer! I think this is one thing I could not be without lol.... I have never tried the concealer with the wand, but I am gonna go get one! did you use shiseido concealers?if you did,could you compare them with this mac concealers for me ? My friend also recommended me MAC concealers because it gives you an awesome finish. I was using a different brand of concealer for my eyes. I'll definitely buy one this weekend.